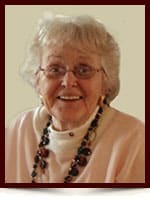 June Thomson - Edmonton's Burial & Cremation Professionals | Trinity Funeral Home Ltd.
On September 19th, 2015 June Thomson of Edmonton Alberta passed away after a long struggle with Alzheimer’s disease at the age of 84 years. June will be lovingly remembered and deeply missed by her husband of 63 years Ogilvie Thomson; children Lawrence Thomson (Adele) of Calgary AB, Donna (Glenn Smith) of Chilliwack BC, and Gray Thomson (Carrie) of Edmonton AB; seven grandchildren Cole, Taylor, Bryce, Perry, Sydney, Jesse, Gray Jr; and one great grandchild Penny Joy. June is survived by her twin sister Shirley Simpson and brother Kenneth Gough. Predeceased by her parents Evelyn and Harry Gough. June was born in Verdun Quebec January 1st, 1931, and had also resided previously in Winnipeg MB, Dartmouth NS, and Fort McMurray AB. Our family would like to thank the entire care team of the Beverly Floor of Miller Crossing Care Centre in Edmonton for their compassionate care and kindness during June’s illness.